PHILADELPHIA -- With a few swings of an aptly colored orange wrecking ball, a hole was punched into Philadelphia hockey history as the demolition of the Spectrum began Tuesday afternoon following a ceremony in the parking lot near the original home of the Philadelphia Flyers. With Philadelphia sports legends such as Hockey Hall of Famers Bob Clarke and Bernie Parent -- as well as NBA legend and former Philadelphia 76er Julius Erving -- looking on, the first step in the tear-down of the building began on a chilly, overcast day. The cold weather, however, didn't stop about 1,000 fans from descending on the South Philadelphia sports complex starting at 8 a.m., about 4-1/2 hours before the first hole was punched into the 44-year-old building. The full demolition is expected to take about four months, and in its place will be Philly Live!, a complex that, when finished, will consist of bars, restaurants and hotels. 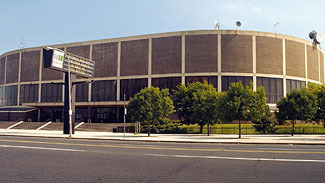 "Many of us have had so many exciting times at the Spectrum," said Philadelphia Mayor Michael Nutter. "This demolition is not really the end of an era, it's the start of a new one for our great city." It was a bittersweet day for many, however. Fans got as close to the fenced-off demolition site as possible for one final farewell to the building, taking their final pictures and video. It also was a hard day for Ed Snider. The founder and current chairman of the Flyers helped finance the construction of the Spectrum in 1966, and saw the building almost like one of his children. "To me it's not a celebration," he told NHL.com, "but in another way it is. I'm very emotional about it. "I'm going to remember all the fabulous memories that I have in that building, all the great events we've had, too numerous to mention. My favorite event was when we won the Cup in '74 on a Saturday afternoon. Pretty spectacular." Clarke, the star of that Cup team and current senior vice president of the team, was also emotional Tuesday. "All of the great accomplishments that the Flyers had and I had as an individual were in that building," Clarke told NHL.com. "That's home for me." Lauren Hart, the daughter of Flyers Hall of Fame broadcaster Gene Hart and currently the Flyers' anthem singer, will remember the Spectrum as her personal playground. 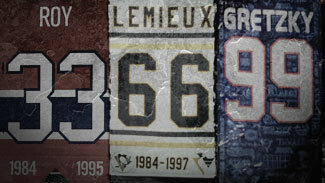 "For me, this is my childhood," she told NHL.com. "I spent it growing up here and running around this building. It's the first time I sang in a really big place. It holds so many memories for me other than sports. It's so personal with my father and my family. It's a really bittersweet day. I'm thrilled to be part of the Flyers the way I am and it's hard to let go of the past a little bit." Snider was the final speaker on the dais prior to start of the demolition, and in his final words said, "Let's see this wrecking ball. I don't know if I want to see it, but you all can see it and let me know what happens." He left not long after the first strike against the brown-brick façade. For many years the Spectrum was the hub of the Philadelphia sports and entertainment scene, hosting not only Flyers and 76ers games, but also college basketball, concerts, ice shows and numerous other events. "Many of you I've talked to over the years, they've discussed how maybe they had their first date at the Spectrum," said Flyers President Peter Luukko. "Maybe they went to the circus as a family for the first time at the Spectrum. Maybe a father took his son for the very first time to a Flyer or Sixer game or a college basketball game. That was the Spectrum." It wasn't just the fans who had great family experiences at the building. "The thing that came foremost to my mind," said Flyers Stanley Cup champion Don Saleski, "is 37 years ago I met my wife Mary Ann there. If it wasn't for the Spectrum, I would never have met Mary Ann, had two great kids and two grandchildren -- soon to be three grandchildren -- all because of the Spectrum." However, with the Flyers and Sixers moving across the parking lot to the building now known as the Wells Fargo Center in 1997, the Spectrum was seeing less and less action. The decision was made in 2008 by Comcast-Spectacor, the parent company that owns the Flyers, Sixers, Wells Fargo Center and Spectrum, to demolish the Spectrum to make room for the Philly Live! project. "I understand the building has gotten old and has to be replaced," said Clarke. "We're all old enough to understand that buildings get old and have to be replaced. We love that building. But you move houses sometimes; it's time to move buildings." While the Spectrum may be gone, the memories made in the building one Philadelphia-area columnist once derisively called "The Fish Can on the Delaware Flats," will live on. "Time marches on," said Erving, "but memories last forever."